Weighty Matters: Is This Epic Study Disclosure Statement the World's Greatest or Most Absurd? Is This Epic Study Disclosure Statement the World's Greatest or Most Absurd? And I'm not asking snarkily, I honestly don't know. Thanks to Marion Nestle for sending my way the disclosure statement (all 1,349 words of it) that's attached to a recent meta-analysis of controlled feeding trials and the impact of fructose on lipid levels and published in The Journal of the American Heart Association. Given of late there has been a great deal more media scrutiny around conflicts of interest and science, perhaps this epic statement, which includes the disclosure of a second place win in the student food competition "Mission Impulsible", is meant to protect researchers against any suggestion shy of total disclosure. That said, given the disclosure statement's incredible size and scope, I wonder if it helps readers? 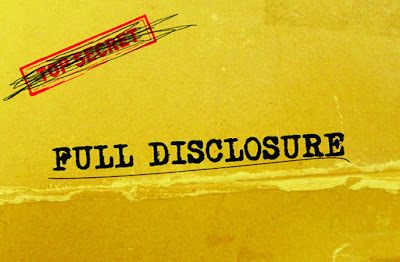 "Does this level of disclosure raise the bar for disclosure and provide readers with valuable information, or does it instead venture, whether intentional or not, into a degree of disclosure that borders on the absurd and consequently unhelpful?" "Listing grants from government agencies and listing scholarships seems odd, but perhaps that's normal? Anyway, the net effect -- intentional or not -- is that the disclosure amounts to information overload. It's a bit like a physician answering a patient's questions about side-effects by handing him or her a long fact sheet from the pharmaceutical company. It's hard for the reader to sort out what matters and what doesn't. Perhaps the authors' fellow scientists would know what to look for -- whether there are financial ties that are worrisome. But to most readers, it would just be overload. To a non-scientist, it reads like a bit of a joke. Maybe the authors are tweaking the noses of the editors, and of those who think disclosure of financial ties is an important thing." "If we take disclosure seriously, we need to make sure that we do it in a way that is useful to interested stakeholders. Simply dumping information on people is a poor way to satisfy the relevant obligations."